Work can occasionally be entertaining, especially when you work with a guy like Bad Pork-Loving Jew (hereinafter "BPLJ") (formerly known as "Sisqo" on this blog, but he said he preferred this new alias) (seriously). This is too funny. I looked up my opposing counsel on the State Bar website and found the following. I just hope he doesn't flash me. [Name omitted] [#Bar number omitted], 39, of Rancho Cucamonga was suspended for one year, stayed, placed on three years of probation with an actual 60-day suspension, and was ordered to pass the MPRE within one year and prove his rehabilitation. 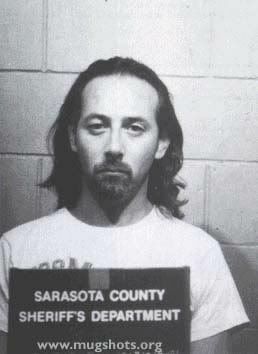 The order took effect Dec. 27, 2000, and he received credit for an interim suspension which began April 14, 2000. [Name omitted] pleaded no contest to indecent exposure with priors in 1999 and was placed on interim suspension in April 2000. He stipulated that his actions were a violation of the State Bar Act. In mitigation, he has no prior record of discipline and he cooperated with the bar’s investigation. Man, the things you can find out on the California Bar website! Let's all cross our fingers for BPLJ. Nobody wants to experience a Pee Wee Herman moment during a deposition. The No White Rice, No White Bread, No White Pasta, No Fried Foods Quest continues. I cheated a little at Trish's wedding. To be exact, I had the following contraband items: spanakopita (damn you, tasty phyllo dough), curry chicken in new roasted potato (damn you, tasty spud), and wedding cake (damn you, tasty fluffy goodness). When Mr. Monkey was in the Midwest for work last week, The Quest was going extremely well, but, now that he's back, I find myself struggling to keep this up. Knowing full well that I was on this limited diet, Mr. Monkey agreed to go to a ramen place with his family this past weekend, which sort of pissed me off. It's a ramen place! All they serve is -- surprise -- RAMEN! While everybody else slurped up huge bowls of noodles, I ate a tiny plate of vinegar pork. Even Li'l Monkey Niece ("LMN") savored a small bowl of fried rice. Everybody at the table was commenting on how great the noodles and soup were. I just pushed my stupid dinky little slices of pork around my plate, attempting to coat them in more vinegar for more flavor. Pathetic. I guess they're not really related to this fat post, but here are some pics of LMN at the ramen place. (I guess they're sort of related. You can kind of see the big bowls of noodles I couldn't eat.) Even though I had plenty of time for snapshots in light of my minuscule meal o' meat, LMN was just too fast for my iPhone. Notwithstanding wedding and ramen hurdles, I press on. At lunch, I had a grilled chicken salad with balsamic vinaigrette. I got hungry around 4 p.m., so I ate one stick of low-fat string cheese. For dinner, I had a small turkey sandwich on thin slices of multigrain bread and a nectarine. Just one foot away from me, Mr. Monkey inhaled half a fried chicken, a bowl of Rainier cherries, two old fashioned donuts, and two Diddy Riese cookies. He weighs only six more pounds than I do and is seven inches taller. On Saturday, Spyro and Trish became husband and wife. It was an awesome wedding, and the Monkeys had a wonderful time. Thanks for inviting us, and congratulations to the newlyweds! You may click any photo to enlarge. Finally, here's one last pic of a handful of girls I've come to know and love over the course of the past year and a half. Congrats again, Trish and Spyro! I love The Simpsons. I'm excited about the movie. 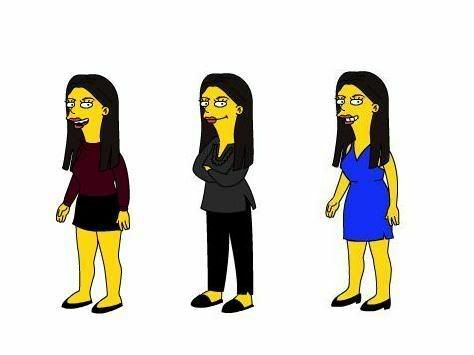 Here's what I'd look like (in three different outfits) if I lived in Springfield, courtesy of the handy-dandy Simpsonize Me. Upload a photo and then dress yourself! 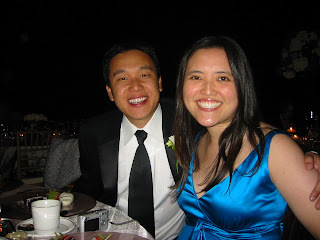 For comparison's sake, here's me in a bright blue dress with Mr. Monkey. Tonight I finally met a number of lovely ladies who entertain me on a regular basis. In fact, some have been doing so for over a year now. Yes, more Internet friends. Call me lame, but what did you do tonight? I had a margarita, Mexican food, and laughs with friends, so there. And just what was in the festive bag that yielded a giant sombrero, singing, and free flan? If you don't know why this is funny, you'll just have to remain in the dark. If I told you, it just wouldn't be as funny. Ok. Here's a clue. And 10Years was slightly more jazzed about the keyboard than the above photo would lead you to believe. See? Kudos to Wan for the idea and being my partner in crime. Sorry I didn't have time to get a Barbie pink keyboard! My e-pals were even prettier in real life than in photos I'd previously seen. I felt rather pudgy the whole time. It didn't help that laundry issues resulted in my having to don an oh-too-tight shell that I hadn't worn in nearly two years. Back fat and rolls galore. Ugh. This picture confirms that my fatty boombalatty feeling wasn't unfounded. Now I know why there was this beeping noise every time I backed up. While at dinner, I didn't eat any chips, guacamole, or rice. I ordered chicken in mole sauce, and I scraped off most of the sauce, even though the mole was yummers. I boxed up about half of my meal. I also resisted sampling some of 10Years' unbirthday flan. My usual practice would be to eat an entire of basket of chips by myself, accompanied by a vat of guac, followed by gorging on mountains of rice. Not to mention, in an ideal world in which calories didn't count, I'd eat four tacos in addition to lard-laden refried beans smothered with melted mounds of cheese. Too bad I actually used to eat like this in our world, where calories do count. When I got home, I rode my elliptical for an hour. And, to tell you the truth, I'm hungry again, but it's midnight, and I really shouldn't eat anything. Boo. According to the L.A. Times, obesity is contagious. Apparently, if your friends are fat, you are three times as likely to get fat, too. I hope the converse is true, although the article says nothing about the effects of having thin friends. 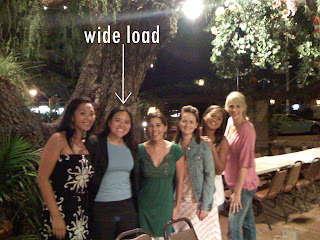 In any event, this particular group of girls is very good at losing weight, and they do it in a non-crazy healthful manner, so, even if having thin friends may or may not make it more likely that I'll be thin, at least having these thin friends -- 10Years in particular -- will motivate me to lessen the wide load.